Dr. Ercoli is chairman of the Prosthodontics Postgraduate Training Program at EIOH. A native of Italy where he earned his dental degree, Dr. Ercoli continued his advanced training in ways to restore the comfort, appearance and function of the mouth when patients have missing or damaged teeth (prosthodontics). He is also trained in treatment of the jaw and facial muscles (the areas affected by TMD and TMJ), and of the gums and tissues that support the teeth. Dr. Ercoli is internationally published in prosthodontics and implant dentistry and has lectured locally, nationally and internationally. He is a Diplomate of the American Board of Prosthodontics and past president of the American Prosthodontic Society. He enjoys treating patients, and his double specialization allows him to be your expert for simple and complex needs. Dr. Carlo Ercoli graduated from the "Enrico Berlinguer" Dental Technology Institute in Rome in 1987 and obtained his dental degree from the University of Siena, Italy in 1993. He specialized in Prosthodontics in 1996 at the Eastman Dental Center in Rochester, New York, where he also completed a one-year training in Temporomandibular Joint Disorders in 1997. In 2012, he achieved specialty certification in Periodontology at the University of Rochester Eastman Institute for Oral Health. He is currently Chairman of the Prosthodontic Postgraduate Training Program at the University of Rochester, Eastman institute for Oral Health. Dr. Ercoli is a diplomate of the American Board of Prosthodontics, an ITI Fellow and holds memberships in several dental organizations including the American and International Association of Dental Research, American Academy of Periodontology, the American College of Prosthodontists, Academy of Osseointegration, American Academy of Fixed Prosthodontics and American Prosthodontic Society. He is a Past President of the American Prosthodontic Society. 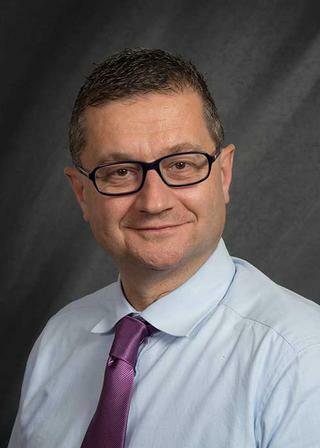 Dr. Ercoli has authored several publications and his research interests are focused on the biomechanics of dental implants, cutting protocols for bone and tooth preparation, and on clinical and laboratory testing of dental materials and techniques. He maintains an intramural practice limited to Prosthodontics. He has lectured nationally and internationally on several topics related to clinical prosthodontics and implant dentistry. Second Place Tylman Award, (Co-investigator) "The influence of metal finishing on porcelain porosity and bond strength at the metal-ceramic interface". Weitz, D.; Geminiani, A.; Papadimitriou, D.; Ercoli, C.; Caton, J. "The Incidence of Membrane Perforation During Sinus Floor Elevation Using Sonic Instruments: a Series of 40 Cases". Int J Periodontics Restorative Dent; 34:105-12. 2014; . Rotella, M.; Ercoli, C.; Funkenbusch, P.D. ; Russell, S.; Feng, C. "A comparison of the cutting performance between single-use and multi-use diamond rotary cutting instruments with turbine and electric handpiece". J Prosthet Dent. Jan;111(1):56-63. 2014; . Abdel-Azim, T.; Fantuzzo, J.; Batalocco, G.; Cho, S., Ercoli, C.; Morton, D. "Oral Rehabilitation of an Edentulous Patient Using Two-Segment Le Fort I Repositioning and Implant-Supported Fixed Prostheses". Int J Oral Maxillofac Implants. 2013; 28(2): 106-111.